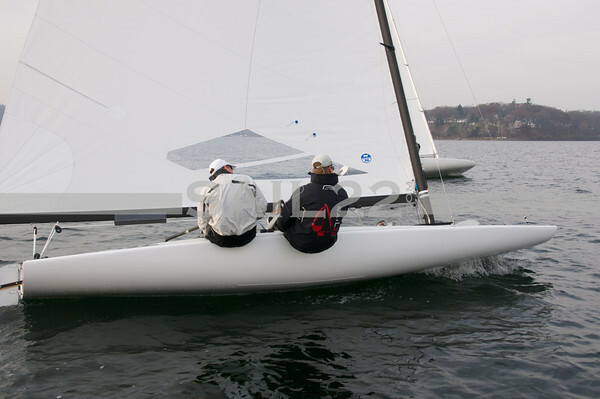 As the C Scow Class President, Ed was invited up to Melges in Lake Geneva, WI for the first sail of the new 2013 C Scow. We have a 1998 C currently and it's a great boat...but we'll be looking to upgrade soon! We had a beautiful late Fall afternoon...crisp, medium breeze and a little bit of sun here and there. Ed sailed with Jim Gluek on the 2013 C Scow and Andy Burdick & Matt Pistay sailed the 1999 C Scow (B-16), which was known to be a fast boat. The rig for the new C was borrowed from Paul Reilly, as it was felt to be a good rig and the new C Scow mast die isn't finished (new masts in January 2013), so we weren't able to test a new rig quite yet. The new C is about 20 pounds lighter in the bow, due to the adjustable forestay being replaced with a fixed forestay. Why you ask? Well, one big reason is to keep water out of the bow of the boat and the adjustable forestay was a big entry point. Take all of that hardware out and replace with a simple, lightweight turnbuckle and it's a big difference. The reason for the effort to lighten up the bow of the C Scow dates back to Melges switching over to their M-Preg process which infuses the fiberglass with resin leading to a more even distribution, however this results in less control to keep the ends lighter. C Scow sailors felt that the 1998-2000 boats were better due to this. Sailing the C in big waves can be a challenge as the flat bow likes to dive into the waves. Keeping the weight out of the bow if very important in these conditions. The sailors asked for this and Melges listened. The bow of the 2013 C Scow we tested also had no rub rail, again to keep water and weight out of the bow. And besides, the boats really shouldn't be hitting other boats or the dock, right? It's rare to find another sailboat with a rub rail these days...but if you really want one, you can have it added as an option. Another big update is the use of cubetainers in the bow of the boat for buoyancy to replace the styrofoam that was previously used. This will help with weight, especially as the boat ages, as there isn't any foam to absorb water. 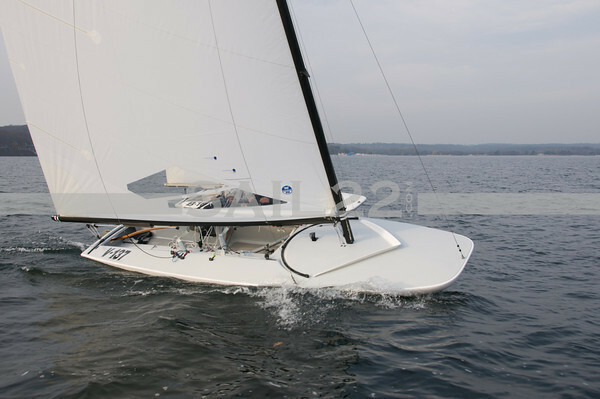 Now that the class has approved Carbon tillers and tiller extensions, they will also be options for the 2013 C Scow. Other options for the 2013 C Scow include a gray deck and also a Soft Deck (they are great, we make them for other Melges boats and the new J/70) which means it's now super comfortable to sail barefoot on those hot summer days. The only other change was with the outhaul. It is back on the boom right above the crew and easy to use without extra rigging to get it back to the skipper. I'm sure if you like the old style, it is still an option. 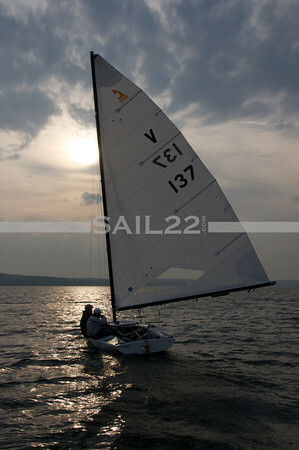 Becky was on the water with Harry Melges during the test sail and her camera. Check out her gallery of the New 2013 C Scow for more pictures from the test sail. So now the sailing side of things. The new 2013 boat felt great. Having Jim Gluek driving didn't hurt things! As every new boat should feel great and work very well, it did. But aside form just having that "new boat feel", everything just worked very smooth. We had pretty consistent breeze and small waves since we had the lake to ourselves. It truly was a perfect day for the initial sail. The bow on the new boat was noticeably lighter in the bow. Some of the photos may not give it justice. If you look at crew weight I was in the front with Jimmy driving so much more weight forward than Andy and Matt who had their weight reversed from us. The leeward bow rail was skipping off the waves more with the waves breaking back about a foot. When we switched boats there was some splash forward even when I was driving with Jimmy crewing. Both boats were definitely fast and there really wasn't a huge speed advantage for either boat. This is a good thing, as the goal is to make the new boat perform like the 1999 and not exceed it. With a new mast that might change the game a little. Downwind the boats were very similar in speed. After over a mile the boats were right with each other. This is a great thing as a slower boat would definitely be pushed back after that kind of time. I think the big test will come in wavy conditions. Even if these two boats are the same speed in medium breeze and small waves, that will change when the waves pick up. This is the selling factor for a new boat. The stiffness of a new boat will come into play as the waves get bigger and the breeze builds. This is just a fact and a good thing to get new boats on the line. My end reaction is my boat is a great boat. But it is a 1998 that is fairly lightly used. If I had the time to sail C's more and the money I would buy a new boat for sure. Melges does a great job building solid boats and my 15 year old boat is definitely not going to be as fast as a new boat. Yet, the simplicity of the new forestay that is still easy to change between races sells me. I also like the fact that there no place for water to enter the boat from the bow now. I am actually thinking about removing my bow rail to keep water out of my boat. Regardless, I'll be adding a carbon tiller and tiller extension since they are cool and will be less maintenance than the current wood ones. The new C stays true to the previous C Scows without changes that will make older boats outdated and definitely keeps the boat fast and fun. Melges is taking orders for the 2013 C Scow...give Andy or Harry a call and tell them how excited you are for the new updates...and go sail a C...new or old, you'll have a blast!